While the events of this strip don’t occur quite as often due to (the real-life Cornfather) Michael’s drastic weight loss, it does still happen on occasion. And watch out if you’re a waiter who gets his order wrong even a little bit; he has stopped going to really good, favorite restaurants because of this. And yes, while I don’t quite approve of his methods, he has gotten many free meals and gift certificates due to his wanting things just right. Ha! Obviously GUILT has it’s place in one’s dieting! Digital or Paper Cartoon Cake? Most inkjet inks are soy based these days… 😉 And paper is RATHER fibrous. i think digital, Tanya, since this one was 100% done on my cintiq. digital has less calories than paper, right? hmmm What’s the calories of an electron? Or do we have to consider the LCD/Plasma it’s in too? Mmmm! I love La Conversation! I keep meaning to ask for a job there. Michael must be friends with my father. Dad is not really on a diet (thanks heavens he’s in no real need of one – eh, except now and then *LOL*), but if he’s not truly satisfied with his order he STOPS going to the place altogether and he’s very vocal about it so sometimes to get on his good side he gets stuff “on the house”. I clearly disappoves of his behavior and most of the times I don’t go to eat with him anywhere but in our house and even then he dares to complain to mom. Which then its funny since mom glares at him and eventually declares “do it yourself next time”. This has gotten mom outta the kitchen many times *LOL* Moms know how to twist things in their favor. yeah, michael’s pretty loud and vocal when he’s displeased with his food order, but then, he’s just loud period! i can hear him talking on his cell phone with my bedroom door closed and my music turned way up! he just has one of those voices, i suppose. Hahahaha! JB’s look in the second panel is awesome! CF’s face in the last panel: priceless. This strip made me laugh out loud. That was pretty evil, but look at CF’s face.. d’aww!! glad you caught jefbot’s look, Spanky! i do that look all the time. heheh. it’s kinda of a “schuetze” thing as my sisters and i learned it from our mom. you may remember jefbot using that glare in the Bad Engrish strip a couple months back. Ha! I love The Cornfather’s eyes in the last frame…. P. S. Dieting is never fun! Especially when German Chocolate cake is involved! EVIL! Rock on! true that, Jeff… er, Funnyshaffer! 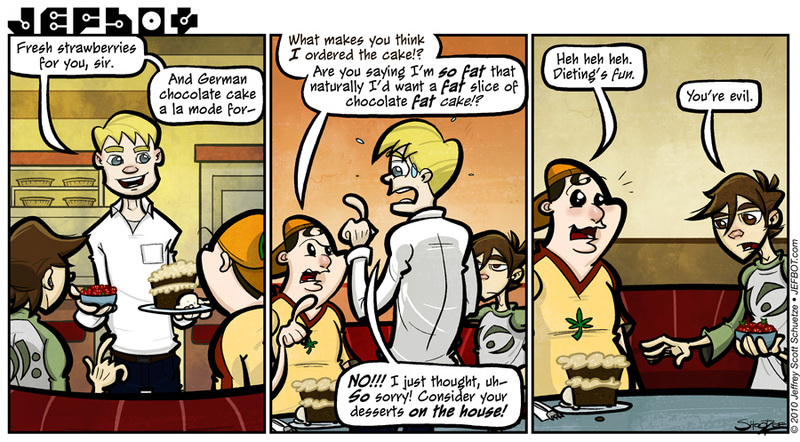 and, totally – german chocolate cake is pure evil. P. S. I agree with everything Jeff Payton said, because it was actually my comment but I was using his computer ; ” I’m sure Jeff will have something brilliant to say as well… (But mine will be better..) P. S. I really hope The Cornfather doesn’t get that skinny girl syndrome, where they think everything people say to them revolves around how they used to be fat and now they’re so think a beautiful… Excellent strip as always Jefbot… Rock on! when i read your above comment as Jeff it had a completely different tone, Funnyshaffer. weird. EWWW. each time you go to that restaurant it’s like being on Fear Factor but without the cash prize, Pearl! Junebug does not make for a better, more appetizing bug. he is! hypnotized with evil, skinny. Awesome! I experience this biweekly. A tiny girl at work and I go out for lunch, she gets the burger and fries while I get the veggie pizza. Guess what happens whenever the food runner takes a guess? i hope you fly off the handle at the server when that happens, D. if not, you could be throwing away free food! As a Waitress, I always asked Who had X? when running food for another table. I started doing so after an experience quite like this. Heh. Granted… there are some trends I do notice… like at the gas station I now counter jockey at… Large Mom, Large Dad, Large Kids, and half my candy aisle on the counter in front of me with XXLarge fountain drinks. Heh. I So Love Life with all of its Amusements. and i bet at least one of those XXLarge drinks is a diet soda, right? and yep, you gotta love life’s amusements or you’ll go crazy, methinks. This made me let out a maniacal laugh. I have fill my evil laugh quota for today, thanks ‘Bot! happy to oblige, Foxmouse! whenever you need another fill of evil laughter just give me a holla. Michael may be able to do it with ease, but i’m horrible at making a fuss and getting stuff for free, Zolen. although i think at least part of the reason he always gets compensated is that he’s much more intimidating than i am. well, at least he was 80 pounds ago. could be, Zolen. who knew Xinda’s evil was contagious? like the swine flu, but worse! It’s good that they did that for desert and not the actual meal. you don’t need any extra ingredients in the food that hasn’t come out yet. You get a waiter that at least attempts to know who ordered what? Whenever I go to a restaurant the following happens. Person 4, Brings out the food and auctions off each plate. Who had the Blah Blah burger w/o the chipotle mayo and extra anchovies? But that is a great glazed over in evil look in the Cornfather’s eyes. This isn’t chicken fingers with lemon juice on it this is chicken fingers with a lemon on the side! the Cornfather’s not that bad, IDTMRB! oh wait, yes he is. never mind. Having cakes for free? I would be Evil too! Unfortunately Im one of those miraculous guys who can eat anything in insane quantities and get hungry in an hour without so much as gaining 2 kg. it’s true. but he’s generally only a jerk if the waiter’s a jerk or is completely negligent with the order, Lax. Hey, as long as everybody gets a giggle, where’s the harm? And you KNOW that waiter is going to add a few fun twists when he tells his mates. Or keep it to himself and seethe, the turn into a pshyco killer. Either way, Michael Cornacchia, BEWARE! THE NUTSO AND/OR WHINEY WAITERS, ARE OUT TO GETCHOO! Ha! Who knew that Corn Father could be that evil. and I love it. tis pretty much hilarious awesome. and: woo-hoo! i loves me some The Book of Biff. Cornfather’s scary but…WICKED. Awesome, even. I wonder if I’ll get a free cake (maybe a steak? or that’s too much wishful thinking?) when I try it. Heh.